In January this year, I started fundraising. 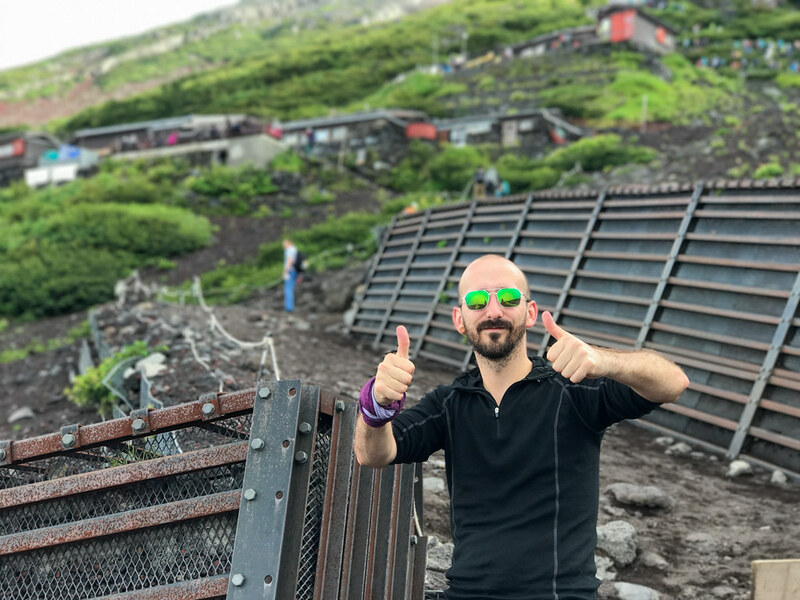 I decided shortly before my 30th birthday, that this would be the year I conquered Mt Fuji - Japan's biggest mountain. Since the beggining of this year I’ve booked accomodation and travel, climbed local mountains and improved my stamina, and read multiple accounts from other climbers who made it to the summit. Throughout the trip, I relied on Ashley (@5ciencePunk) as a voice of reason - running options and ideas by her as she helped plan our transport. It’s refreshingly helpful to hear, “That’s a dumb idea” when you’re tired, stressed and considering any means of making it to the summit. Sadly, all the planning in the world is sometimes not enough when faced with extreme weather situations. And regrettably in this case, it was enough to considerably impact the hike. We were unable to make it to the summit. And though it was unavoidable, it still feels like a failure on my part. Hopefully others will find this useful if chosing to climb the mountain, if you can get over its verbosity and reading a little like a play-by-play crime report. Whilst packing for Tokyo on Monday 7th August, I didn’t think to check the weather. Whilst I had been keeping an eye on climbing conditions the week before travelling, general weather forecasts hadn’t crossed my mind on account of the incredibly warm, sunny days since arriving. When we reached Kyoto Station later that morning, the sky seemed a little grey. After collecting our rail passes 30 minutes later, pouring rain was being blown into the large entrance of the station and the sky looked much darker. It a little worrying given our plans, but we made light of the ominous situation and laughed it off. 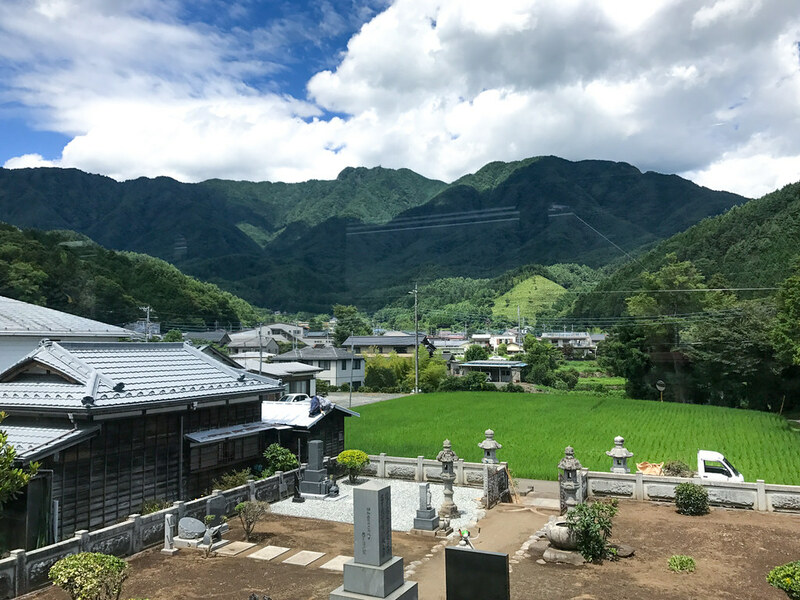 On the Shinkansen to Tokyo, the rain beat down on the windows hard and fast, as frequent typhoon warnings flashed up on the notification screen. Some slow motion video from the Shinkansen from Kyoto to Tokyo - during Typhoon Noru. Now I was beginning to worry. 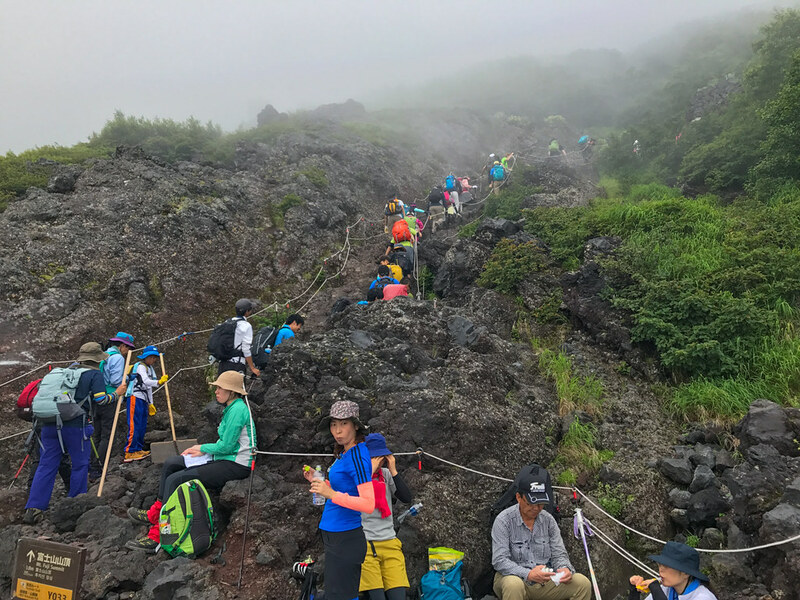 I considered the possibility that reaching the summit - or even the 5th station would be impossible in an emergency weather situation, but didn’t think that travel at normal altitudes would be an issue. In the UK, public transport is delayed and cancelled for even the lightest drizzle or snowfall. Yet it hadn’t crossed my mind that a typoon might have implications for my journey from Tokyo. Perhaps it was just willful ignorance. It wasn’t until later that I learned the full magnitude of the storm1. Arriving in Tokyo Station, we transferred quickly. Heading to Takao was simple enough, and the rain seemed much less aggressive by this point. Skyscrapers gave way to suburbs, which eventually gave way to trees and mountains. As we passed through increasingly smaller towns, a thick mist evaporated from the forests behind them. We transfered again, things seemed to be going well, but by this point we had been travelling for about 6 hours and I was a little fatigued. The train had stopped at Shiotsu station for about 10 minutes before we realised something was wrong. Soon after there was an announcement - which I largely couldn’t understand. After another 10 minutes, and another announcement, some people, seeming a little disgruntled, abandoned the train carriage. I left the train, making my way towards the station’s ticket office. The staff member seemed to be dealing with a lot of complaints, so I waited my turn, then tried asking politely if getting to Kawaguchiko would be unreasonable. He used my own sentence structure in response, to confirm that it would indeed be unreasonable/not possible. When I asked him about getting back to Tokyo, he directed me towards the platform I had come from. I went back to the train, updated Ash on the situation, and helped out a few other tourists in the same situation as us. I tried to make the most of the wait by writing, but was finding it difficult to concentrate. Almost 2 hours after our train had stopped in Shiotsu, it started back towards Tokyo. Whilst it was less than ideal, being stuck in the city was infinitely preferable to being stranded in a small country town. I know my way around Tokyo, I know the transport links. And there are hundreds of hotels, so finding somewhere to wait out the storm would be simple enough. We jumped off at Ochanomizu, and braved the downpour for the 10 minute walk to a hotel I’d booked for later in the week. My clothes were soaked through before the first crossing. I’ve stayed in Hotel Edoya every time I’ve visited Tokyo. It’s central, affordable and includes breakfast. The staff are great, and it’s nice to always see their familiar faces. Additionally, you can choose between western or Japanese style rooms and there is a rooftop onsen which is available to all customers - even those with tattoos. It was a great relief to hear they had an available room. I checked us in without hesitation. Once we were settled and dried off, we took a look at the situation. There were weather warnings for climbers, and the trains weren’t able to take us to our destination. 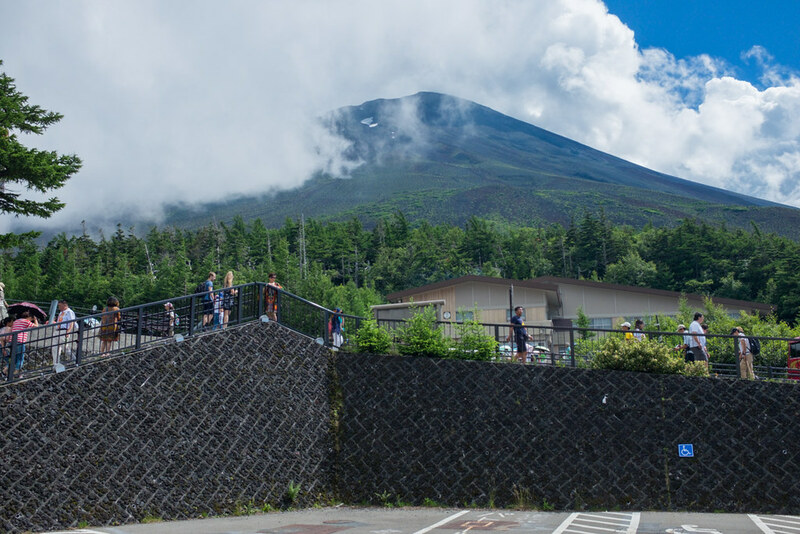 At this point, even if we took a bus directly to Fujisan’s 5th Station, there was no guarantee we would be allowed to climb. If the warnings were still in place at 8AM the next day, we would stay in Tokyo. We needed a fixed cutoff. If we were scaling the mountain to the 7th Station, it would require an early start given the long commute. If we called it early, we could at least make the most of our day in the city and reasses the next evening whether or not we would be able to climb. But this did present a major problem. 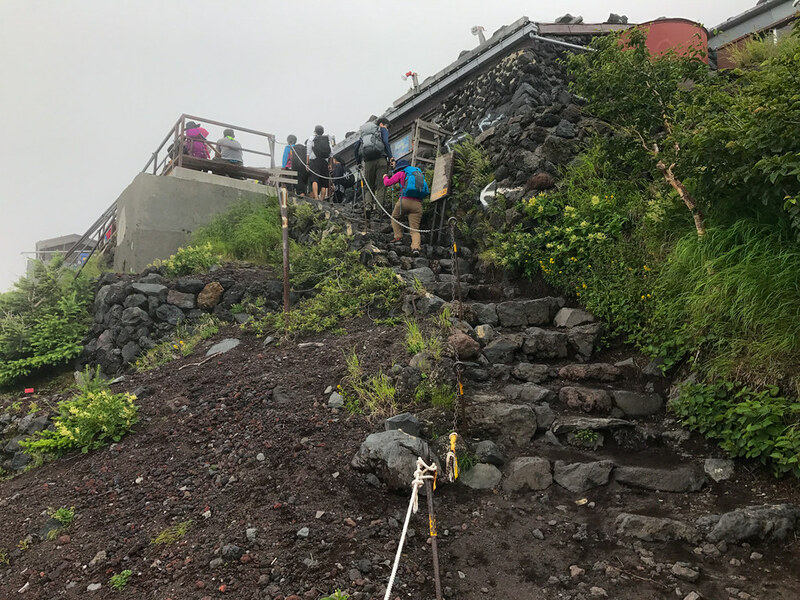 If we didn’t climb the next morning, we would lose our booked space in the mountain hut and due to time constraints and travel requirements, we would be unable to make it to the summit. Like clockwork, we woke up before 6am on Tuesday. The heat had been so crazy that we were largely exhausted by it and going to sleep early each night, and waking earlier than usual as a result. Checking the weather and trains immediately, the news was less than optimistic - still presenting warnings and restricted movement. But it was early, we still had a couple of hours. 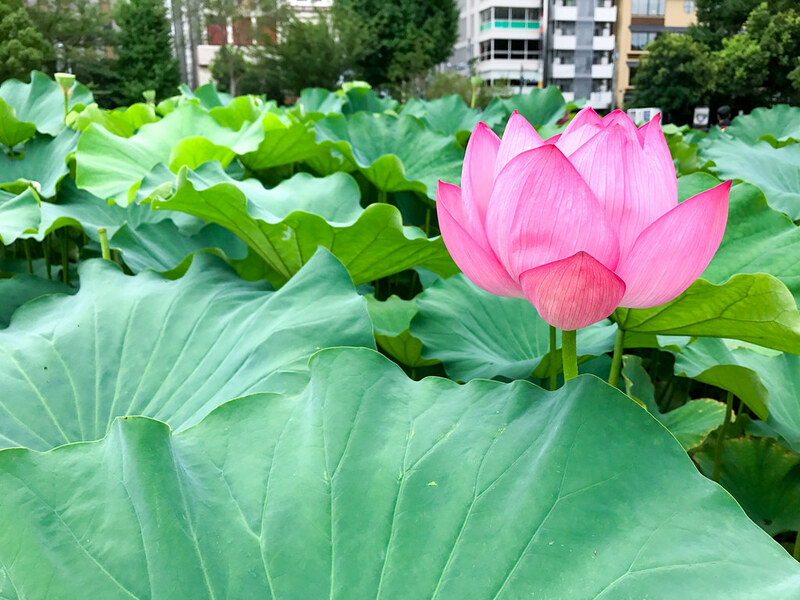 We went for a walk around Ueno park, since the hotel breakfast didn’t start until 7am. 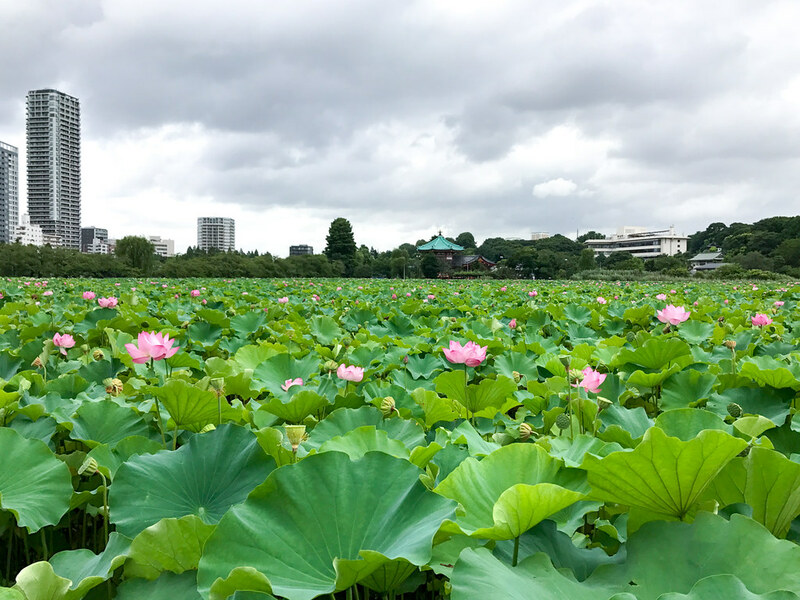 It was amazing to see the entire surface of Shinobazu pond2 covered by fully grown lotus plants, where there had been none during our last visit, in spring last year. We went back to the hotel for breakfast, and checked the status again afterwards. It hadn’t changed. We called it then; we would stay in Tokyo. 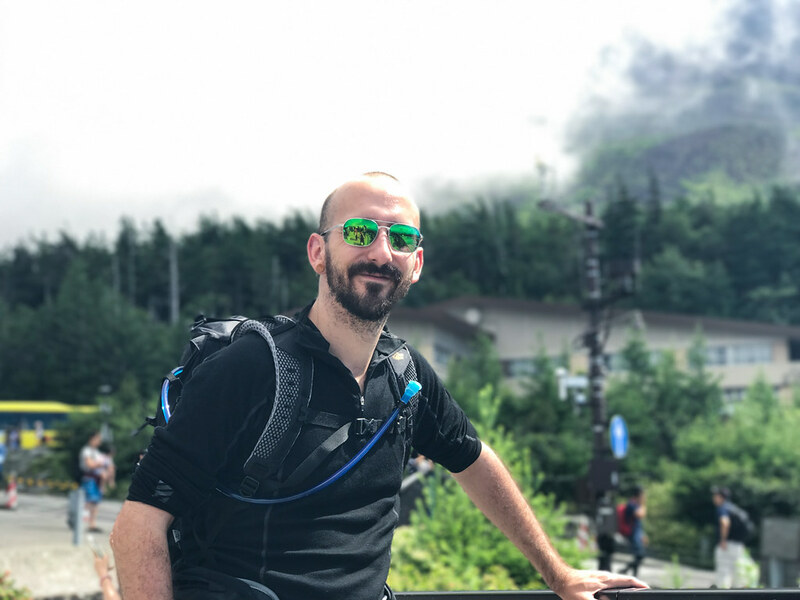 As we got ready to go explore Tokyo, we were already discussing travel times and limitations that not having mountain accomodation would present should we climb the next day. Around 10AM, morbid curiosity compelled me to check the weather warnings again. As luck would have it, the weather warnings had been downgraded to a caution. By this point we had passed our cut off time and had already left the hotel, but travel pending we would be visiting Fujisan the next day. Later we phoned to try and rearrange our mountain accomodation, but as suspected, there was nothing available for the next night. So apologetically, we cancelled citing our reason as transport links during the storm. We packed and checked our equipment before going to sleep the previous evening. Everything was ready to go at a moment’s notice. Whilst we wouldn’t be staying on the mountain, we brought along things like our headlamps and toothbrushes. We had plenty of snacks and water, in the unlikely case we did end up stranded somewhere. Waking up around 7 that morning, we checked once more the weather warnings and train availaiblity. Everything looked good! We quickly got dressed and had breakfast before heading to Ochanomizu for our first train. The route was the same as before, but with much nicer weather. It was a warm, sunny day, with little cloud coverage. Great hiking weather. 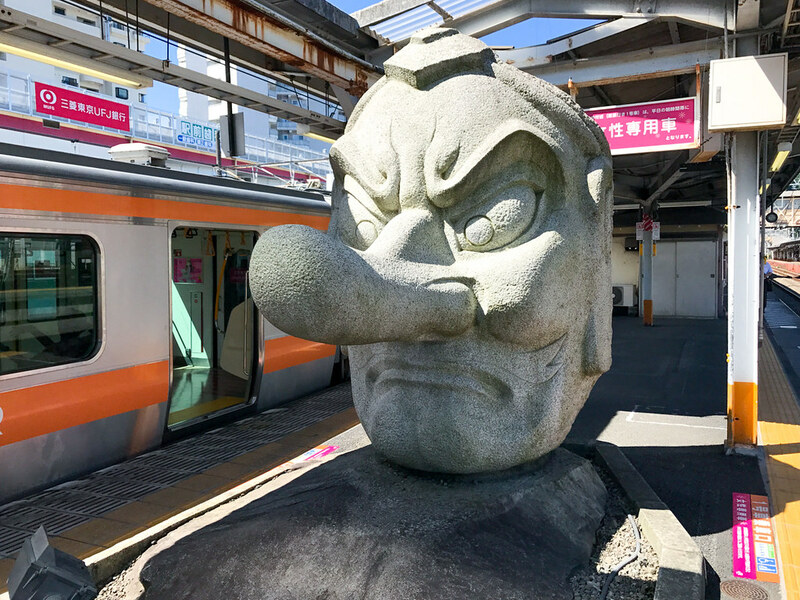 Upon reaching Otsuki Station, we transferred to the Fujikyuko Line. 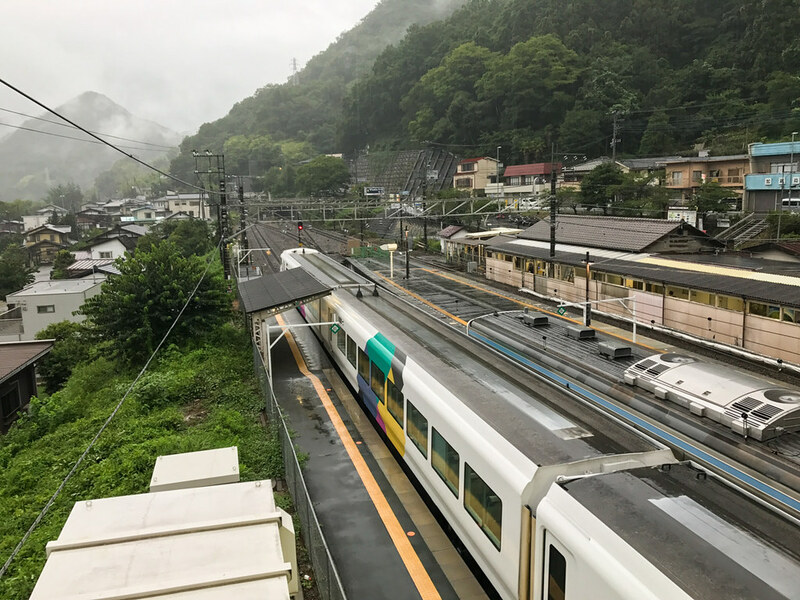 It’s important to note for anyone travelling by train, that JR Passes are not valid on this service, however a Mount Fuji 5th Station Pass is available for about £303. 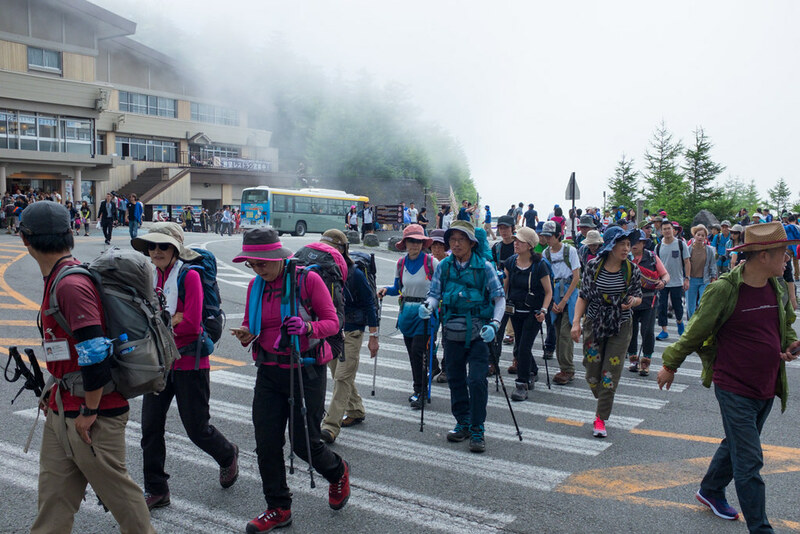 This pass allows freedom of movement between Otsuki and the 5th Station for two days - ideal for those staying on the mountain overnight. This was a nice, slow, scenic route. The train ascended gradually, winding through mountainous terrain. 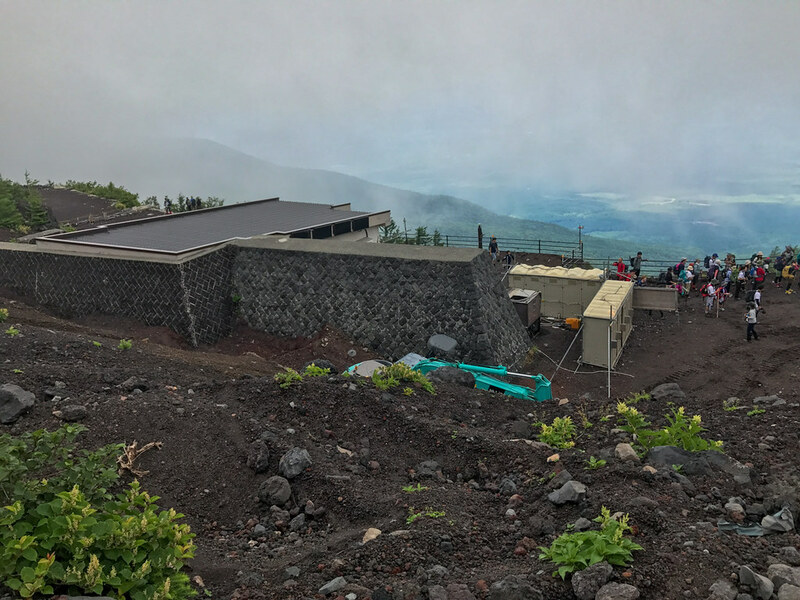 Often we had a panoramic view of Fujisan from the windows, but it was unfortunately covered by clouds, as is often the case. 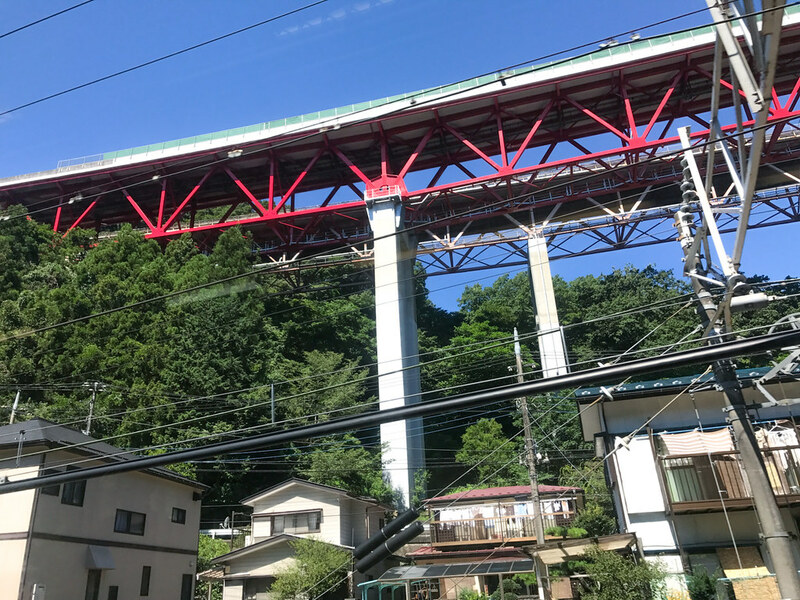 Here’s a tip - if you’re using Google Maps, it will direct you to stay on the train until Kawaguchiko Station before transferring to a bus, but instead we hopped off at Fuji Station - two stops earlier. We managed to get seats on the 5th Station bus from its starting point, before people packed in at Kawaguchiko. 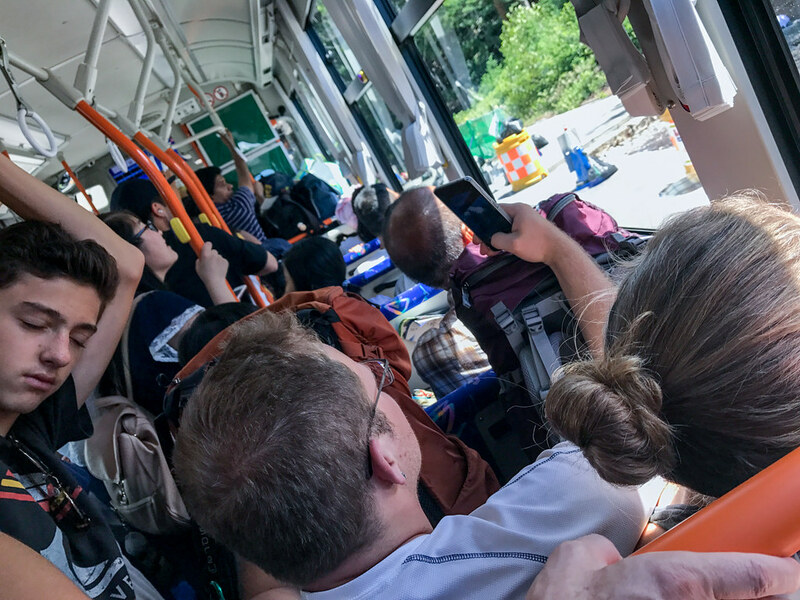 The bus journey is about 40 minutes, and if you’re going to be climbing a mountain, it’s worth grabbing a comfortable seat. It’s also easier to sleep when seated, and I took advantage of this. Inexplicably tired after a good sleep the night before, I napped on and off as we continued our journey. 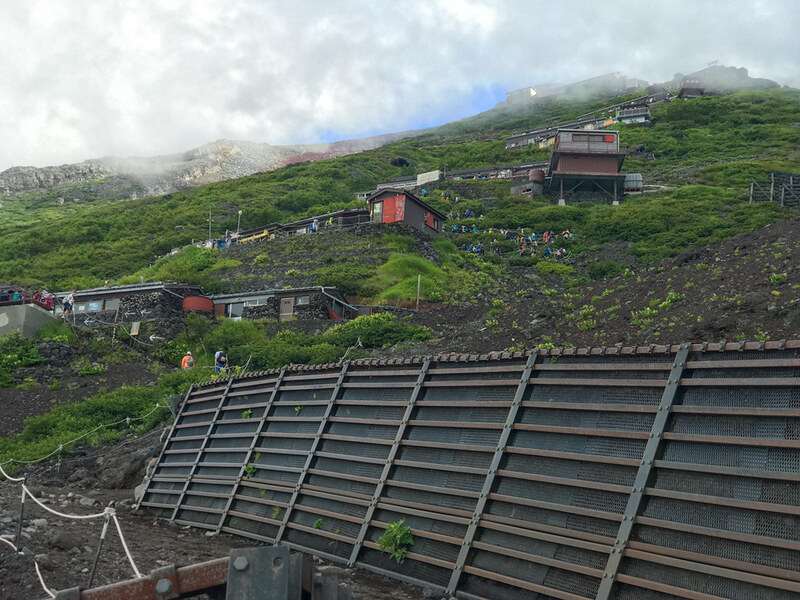 When arriving at the 5th Station by bus, it’s strongly recommended to wait an hour to aclimatise to the altitude. I was hopeful leading up to the trip that I wouldn’t be sensitive to the change in altitude, but upon arrival, I experienced pressure in my forehead and sinuses. This is common, and isn’t problematic in itself. But it is important to pay attention, as the altitude affects each person differently. Know what to expect when climbing4. 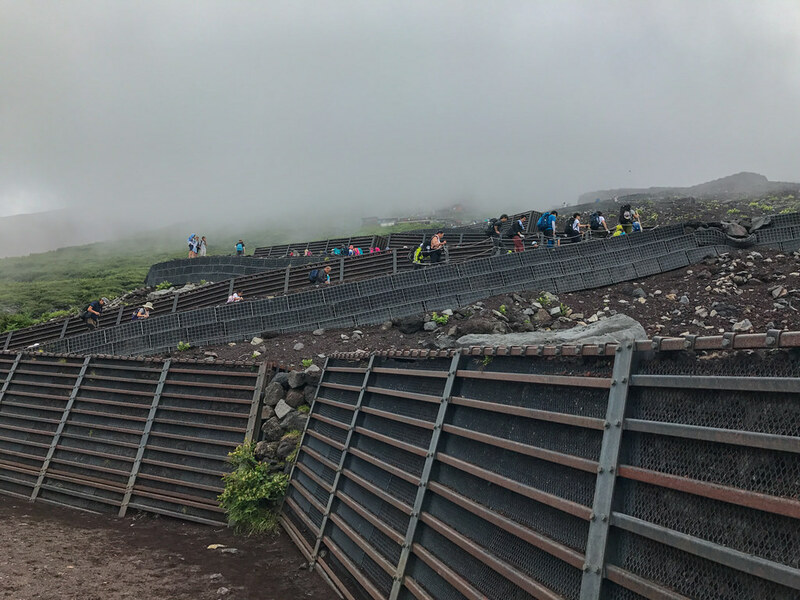 The 5th station itself is a popular destination, with many people exploring the area and enjoying the views without any intention of actually climbing. There are gift shops, a post office, and food stalls selling, among other things, steamed pork buns and Japanese pancakes. 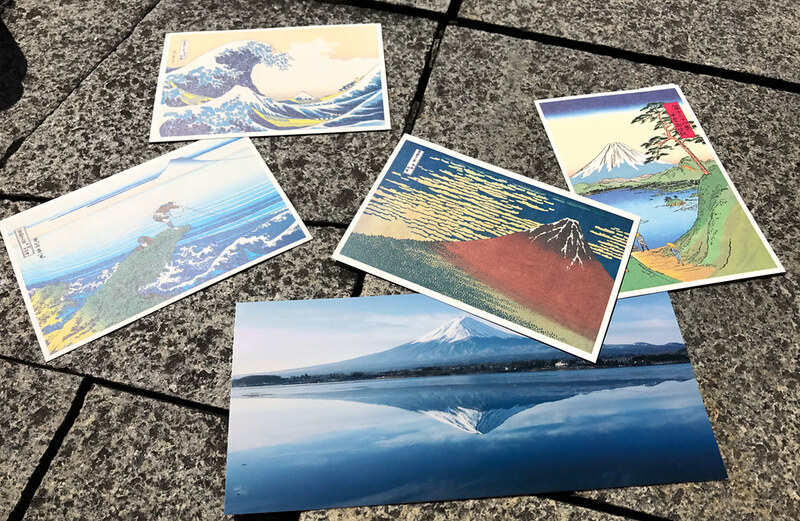 I took advantage of this time to write and send some postcards. Typically when I travel, I don’t send postcards - it’s not something I’ve done since I was very young. There is something to be appreciated in a physical keepsake which someone has taken time to write however. I sent out a small number of these as thanks to people who were generous enough to sponsor me large amounts. There is a small fee, about £8 for passing beyond the 5th Station area. This goes towards maintaining the mountain and its paths. 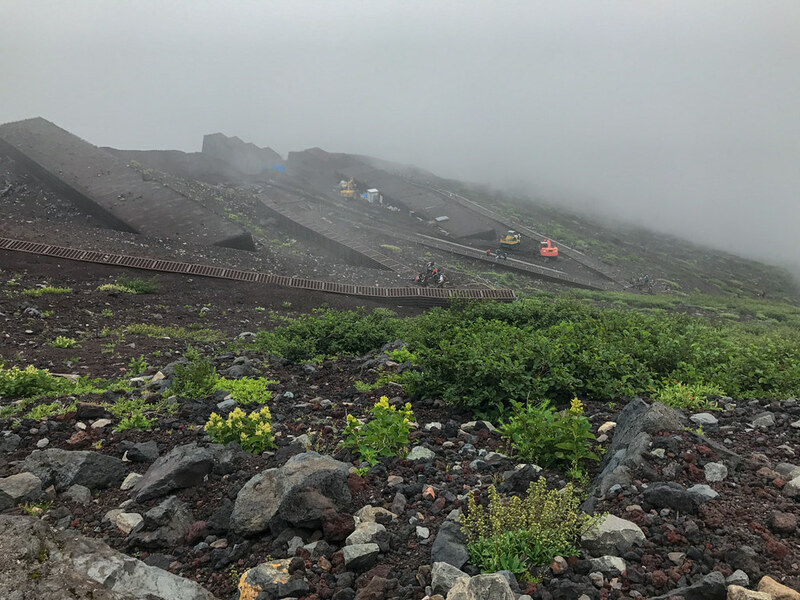 In 2015, more than 234,000 people were recorded as having climbed Fujisan5, though these numbers only take the official climbing season into consideration. 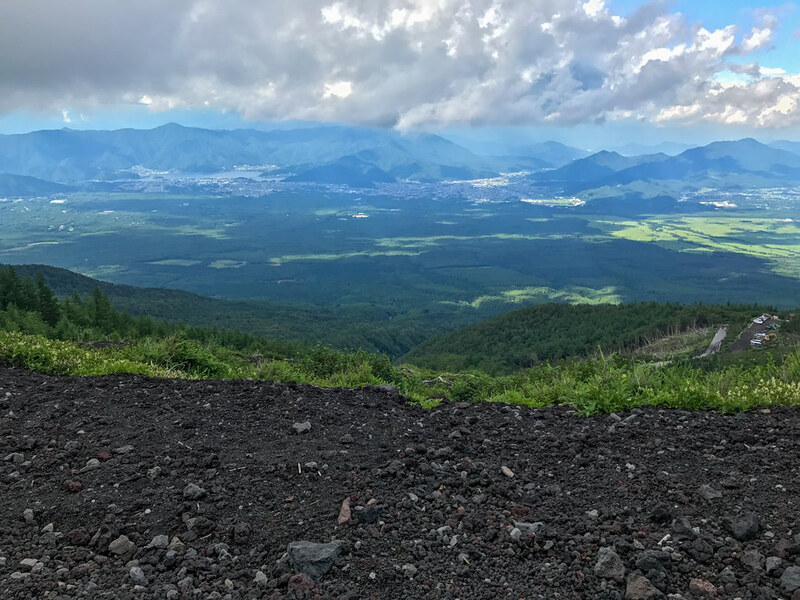 Furthermore, Fujisan achieved its status as a World Heritage site by UNESCO in 20136, due to its strong cultural influence the world over. It is an iconic location, and with a staggering number of visitors each year, it is important that everything possible is done to offset the impact they have on the mountain. After an hour or so, the pressure in my head was gone and I was good to go! We both grabbed a steamed bun, and made our way towards the start of the Yoshida trail. We paid our entrance fee to the mountain, and were gifted with a wooden charm each as a souvineer before proceeding beyond the 5th Station. 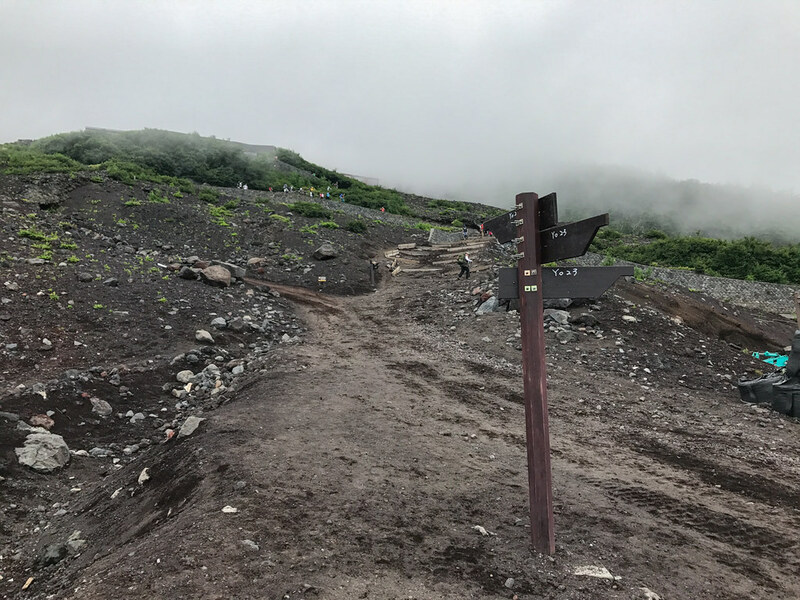 The ground leading to the 6th Station is firm and earthy, with some small inclines and a lot of vegetation. There’s a good opportunity to look down the mountain at this point, for a clear view of the valleys below. Forests as far as the eye can see! At 2300 meters, the clouds passed by us and I would find myself intermitently engulfed in them. At this height, they seemed playful; rising, falling and quickly changing direction. There were clear signs of landslides on either side of the well trodden dirt track. Perhaps simply the result of melting snow each summer. Regardless, the paths were well maintained, so well in fact that we were passed by cars on more than one occassion - presumably from vehicles with a special permit. The exposed roots of a large tree just off the path are unmissable - it’s incredible that it’s still standing upright. Many hikers stopped to take photos, and I wasn’t going to pass on the opportunity. Shortly after passing the tree, we arrived at the next station. It took me a little time to realise it was the 6th Station though, as it was more like a consutrction site than a rest stop. Hard hats were available to rent - for climbers who worried about rockslides. There were also heavy vehicles moving around - it looked like they may have been maintaining the roads. Besides that, there wasn’t a lot to see, so we hurried on to the next station. 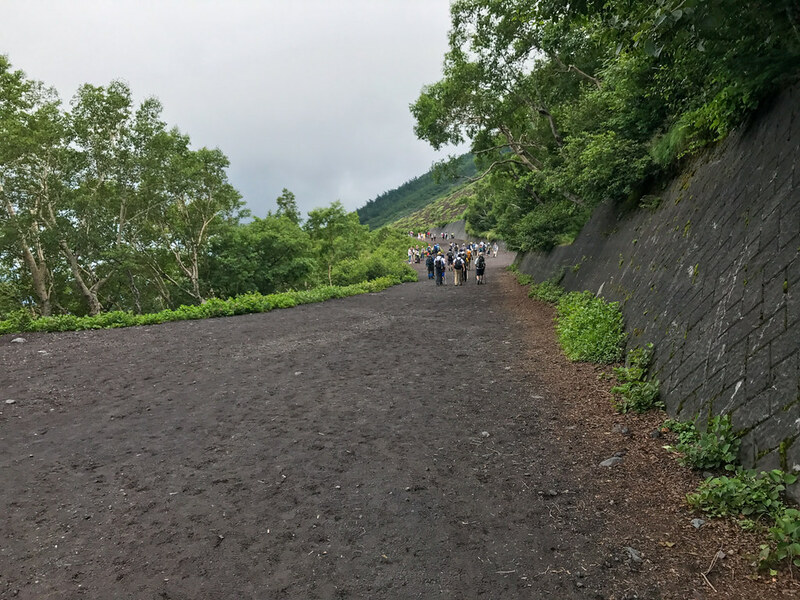 The path towards the 7th Station was completely different from the muddied forrest path leading to the 6th. This is where the ascent really begins. The path zig-zags up the mountain on a loose, rocky path. It’s quite easy to slip as rocks give way underfoot. 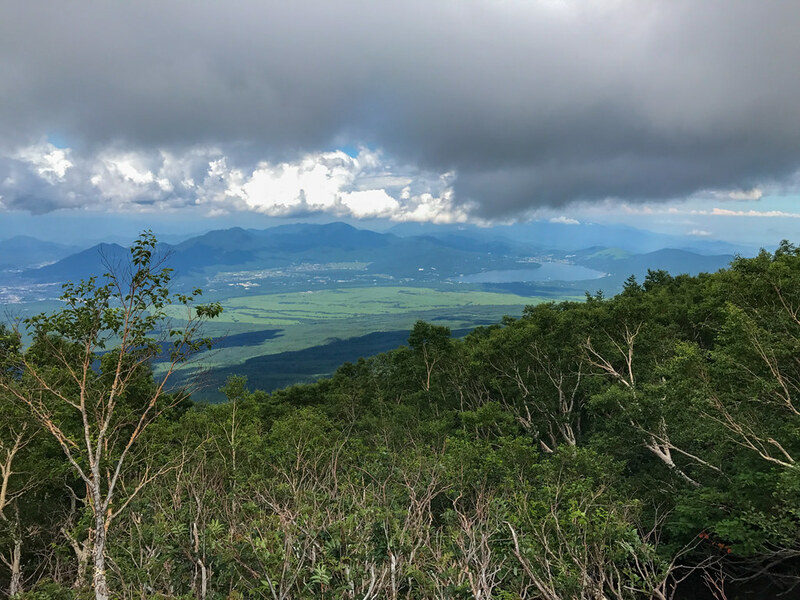 We stopped a little further up from the 6th Station to enjoy some snacks and the view. 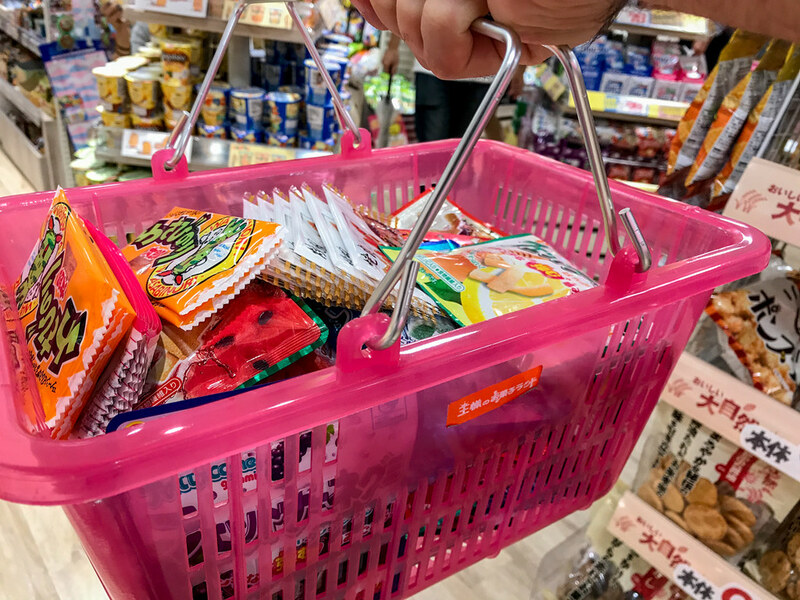 Realising our jouney was almost complete, and carrying enough food and drinks for the entire walk, we were able to endulge a little, enjoying popular favourites such as dried squid. We continued further up the mountain. Shortly afterwards, we both arrived at the 7th Station, where our jouney would end. The 7th Station is in sight! We took another short rest, and watched the large hiking groups pass us by, heading further up the mountain. I was more than a little envious. 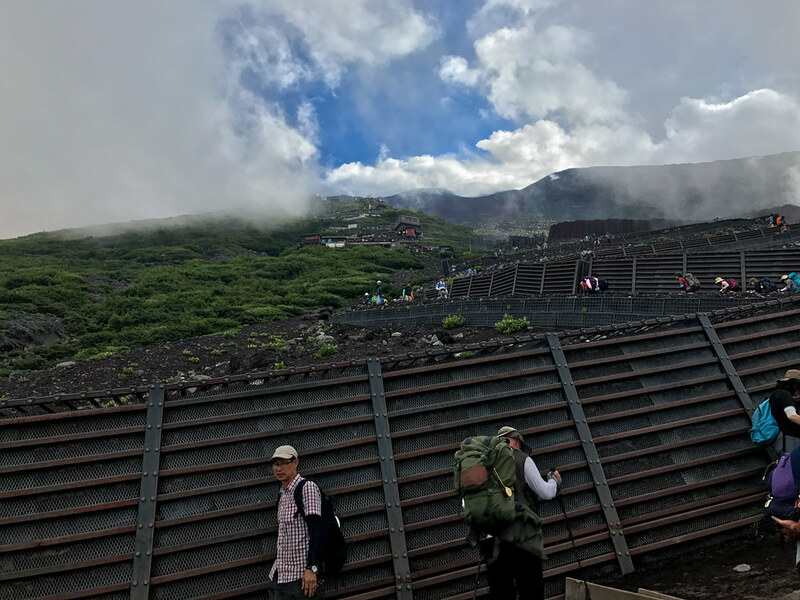 As time marched on, we knew we would have to head back to the 5th Station. If we missed our bus, it would be a while before we could get the next one. It was starting to get a little colder, and it would be getting dark soon too. As we travelled down the mountain, the clouds rushed to meet us more aggresively than before, making visibility poor. 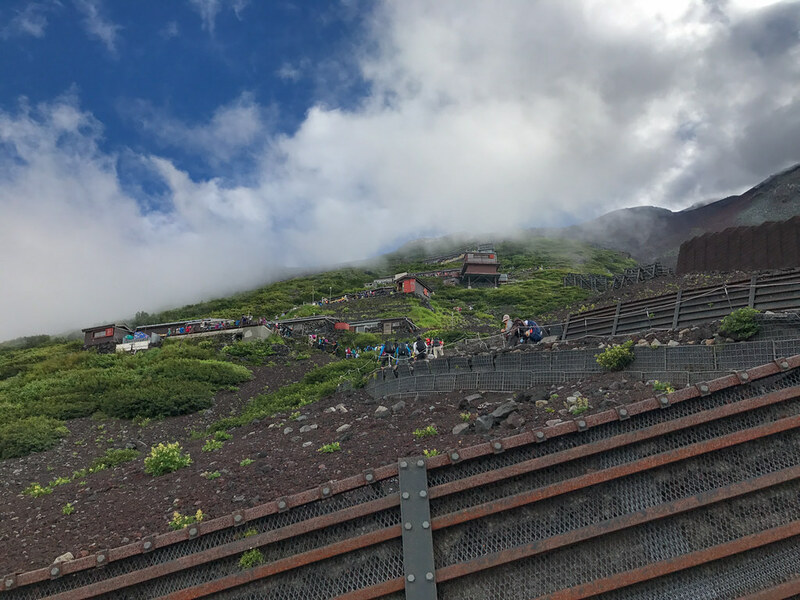 Our return journey was much faster, despite the clouds, and we made it to the front of the bus queue - securing our seats for the return to Kawaguchiko. When we arrived, I tried to get a half-decent photo of the mountain, but the same clouds that obscured our vision on the way down, were now blocking the famous view. 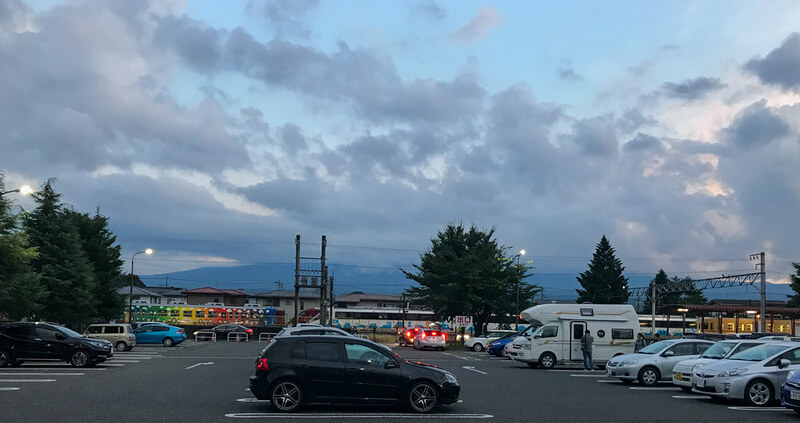 As the sky started to darken at the foot of the mountain, it was time for us to return to Tokyo. I’m moved by the support I’ve recieved for this trip. I announced back in January that I’d be climbing for my preferred charity, SAMH (Scottish Association for Mental Health). Since then, more than 30 sponsors have donated close to £750! 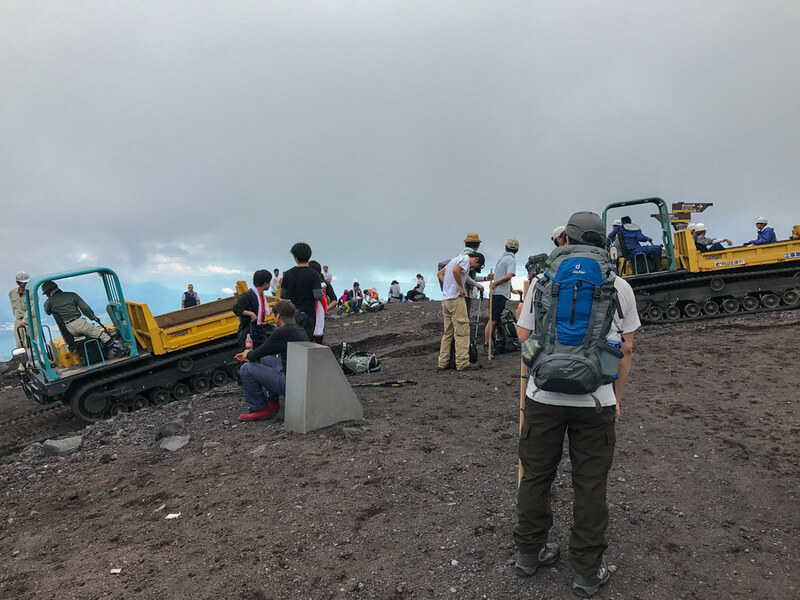 In addition to Ashley’s fundraising, we together raised almost £1000 - which is a fantastic result, even if we weren’t able to make it to the top of Fujisan. Towards the date of the climb, I added some incentives - similar to crowdfunded projects on Kickstarter. Certain donation amounts were eligible for small gifts such as a postcard sent from the mountain and sweets (some of which I still have to send out!). I covered the costs of these myself, but wanted to do something as thanks. 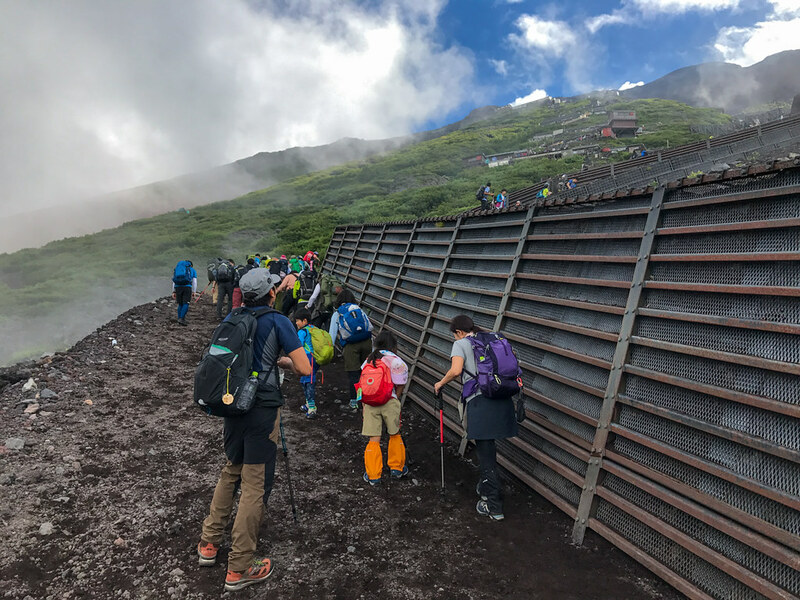 Climbing Fujisan - the tallest mountain in Japan, on Wednesday 9th August, 2017. Sadly I didn't make it to the top! 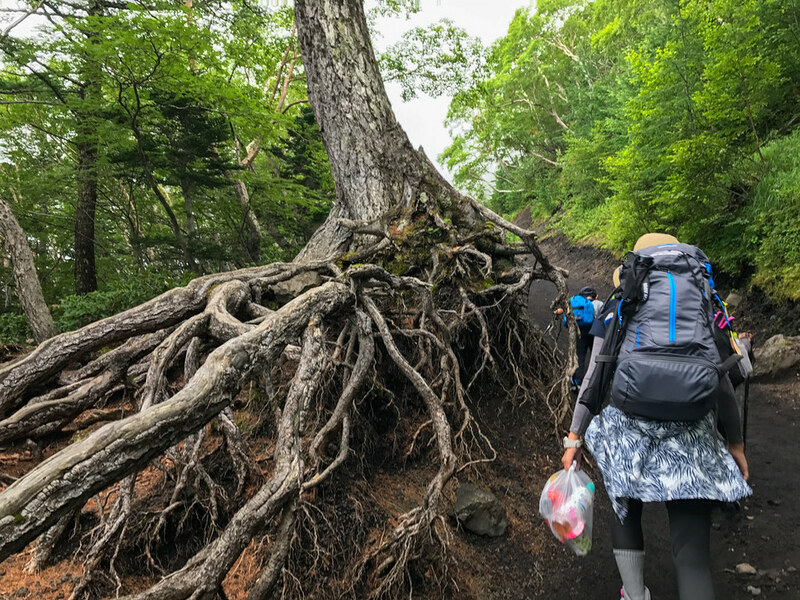 My climb was supposed to be on the 8th, but due to Typhoon Noru, I was unable to travel/climb as planned - so forfeited my mountain accommodation. 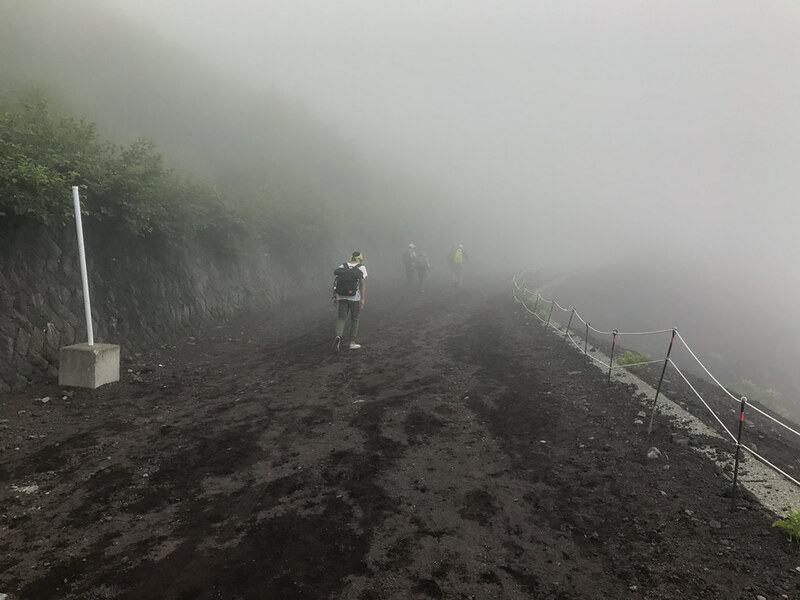 Many thanks to those who sponsored me for my preferred charity, SAMH, for this challenge (https://justgiving.com/mtfuji). Together we raised over £700, which will help them continue to do great work to promote mental well being! Shout out (in no particular order) to: Pete Andrews Sara Mclean Bobby Wright Ian Black John Gurney Allan McDowall Craig Allan Georgina MacGregor Scott Thomson Charles Lawson Sam Grosset Andy Draper Matt Rochester Timea Tabori Karl Zarins Adam Munson Kat Zoe Sams Rachel Crawford Mhairi Bianca Kim Mags Catherine Cosgrove Sean Bartlett Ian Plus, all of my anonymous sponsors! You're all incredible. Rest assured, I'll be back one day to finish what I started. With hindsight it can be easy to choose a different approach if the same situation arises. At the time, my primary concern was safety and comfort - it was my first time experiencing a storm anything like this. 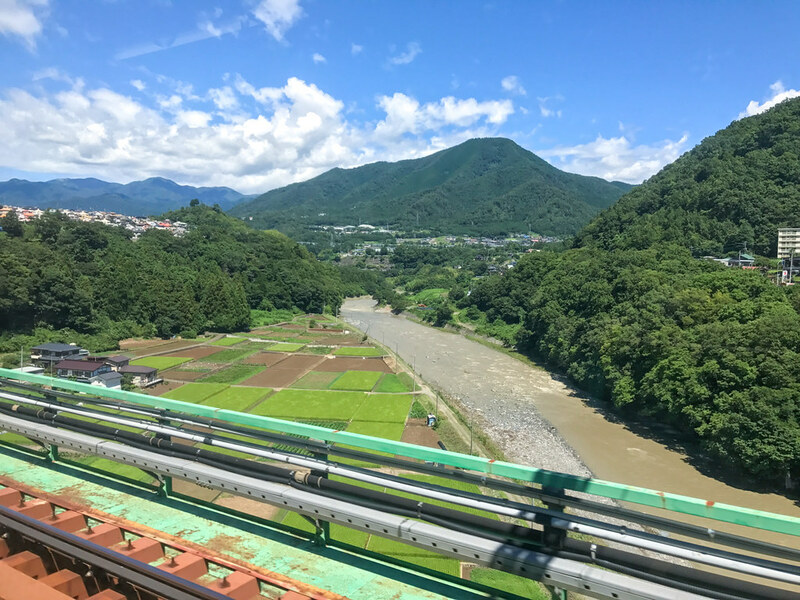 When Ashley and I were stuck on the train at Shiotsu on the way to Kawaguchiko, we had no means of planning an alternate route. Whilst the trains were being cancelled, it may have been possible to find a bus - or depending on the remaining distance, call a taxi to complete our journey. I was able to communicate with with the station master, with what little Japanese I remember. With an internet connection it would have been possible to translate our requirements to a non-Engish speaker. We could have possibly even found and booked accomodation locally, and proceeded the next morning. A pocket wi-fi device is something I’ve never picked up, because I quite like being off-grid when I leave my accomodation, but I’ll definitely consider it for my next trip. Having passed through Tokyo briefly, it would have made sense to leave our luggage at our next hotel. 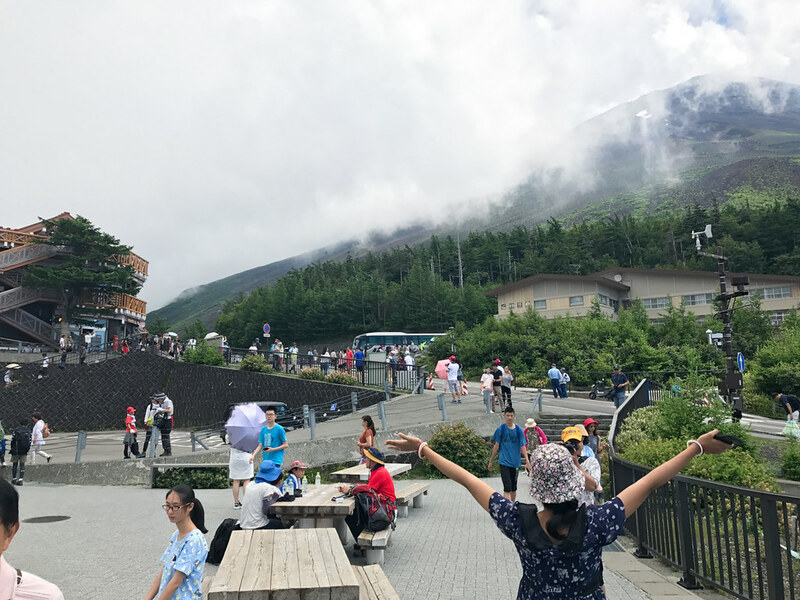 We decided against it, because it would require additional travelling before taking our connection towards Mt Fuji, though I can now appreciate our luggage was a burden, and our backpacks would have allowed for more flexibility. I think it might have been a more comfortable trip without the suitcase altogether, but the past few trips I’ve made to Japan have seen me coming back with a bunch of books and toys. It’s a habit that’s hard to break, given that most of the media I consume originates from Japan, or is influenced by Japanese sources. If I’d waited just one more hour on the second morning, we might have had an all-clear from the weather report. It would have meant a slightly later start, and there was still no guarantee our trains would have been running, but things change and update on a minute-by-minute basis. 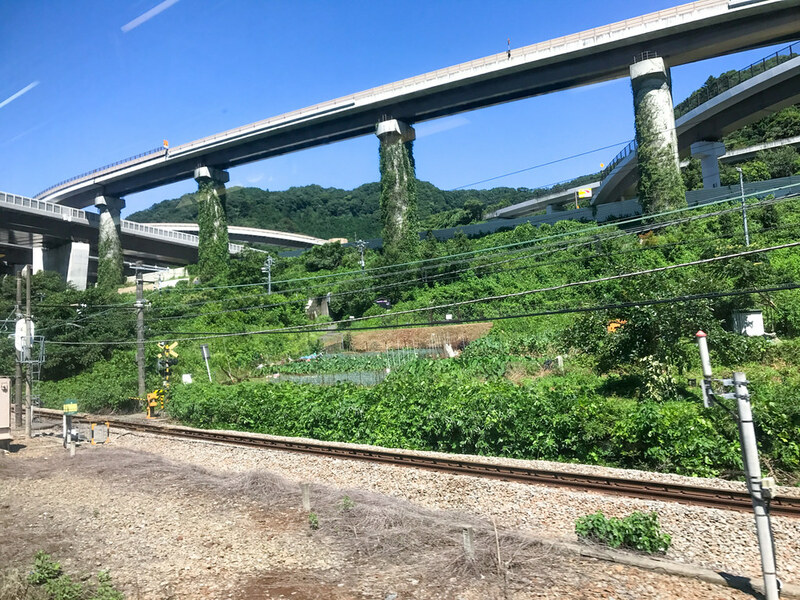 In this case, taking an express bus from Shinjuku directly to the mountain itself7 would have probably been a more sensible travel option. Taking less than 2.5 hours and costing around £25 each way, it’s an affordable and efficient choice. We missed this because we had originally intended on travelling from Kyoto and didn’t book. Morning slots go pretty quickly, so it’s important to book far in advance! Quite often trains stop due to electrical faults, a problem which doesn’t affect buses. Whilst I find trains more convenient for inter-city routes, I’ll know next time to look at buses for local travel. If it wasn’t clear, I’m disappointed about not reaching the summit. People have already told me that I tried my best, circumstances couldn’t be helped and that it wasn’t my fault; and that’s true. This post makes a point of acknowledging my failure though, because ultimately I set out to achieve something, and didn’t make it. I try to learn from everything I do. 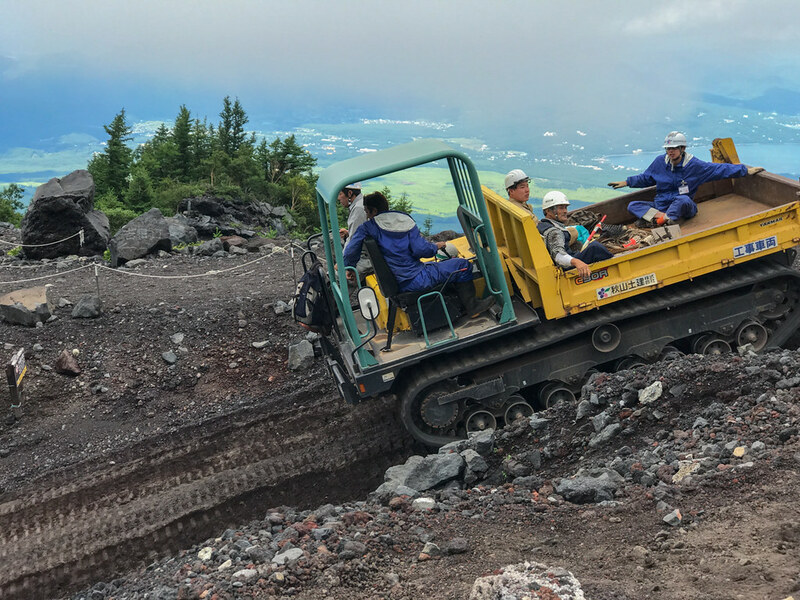 In my first attempt at climbing Mt Fuji, I’ve learned so much I can apply when I return to conquer it! But without accepting this as a failed attempt, I wont be able to fully recognise the achievement when I do succeed in reaching the summit. And next time - I will succeed.